It is turning out to be a wonderful summer! Perfectly warm weather and plenty of time to lounge by or play in the pool. But is your pool safe from bacteria and other harmful elements? Get some more chlorine and chemicals to keep your family safe during the summer! 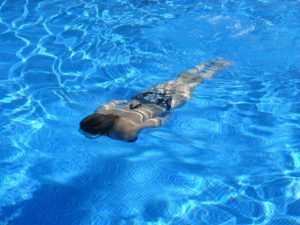 One of the most frequently asked questions about chlorine is which is better; liquid or powder chlorine? There are advantages and disadvantages to each system so it’s more of a personal preference. Liquid chlorine is generally the easiest to use because you just pour it into the pool. It is efficient and cheap compared to other pool cleaning methods. However, for smaller pools, liquid chlorine may damage the lining from the pure strength of it. Powder chlorine is the most popular type used by owners in personal pools. It is an easy way to use sanitizer for your pool. However, it is often more expensive than liquid chlorine. Why are chlorine and chemicals important? Chlorine is the chemical that kills bacteria and algae in a pool to make the water cleaner and safer for the swimmers. Without chlorine, deadly pathogens can be contracted through contaminated water. Pathogens such as E. coli, salmonella, and Crypto are waterborne and can become fatal. Luckily, outbreaks are rare because of the use of chlorine and careful watch on the water’s pH content and alkalinity. Are you looking for a better way to sanitize your above ground pool? Here at Sunny’s Pools & More we offer the best brands of chlorine and chemicals at the best prices. We carry brands such as Baquacil, Pool Marvel, SeaKlear, and many more! Our sales associates can help you decide which brand is best for you and your pool! Are you interested in chlorine and other chemicals from Sunny’s Pools&More? Come on into one of our locations! We have stores in Flat Rock, Livonia, Macomb, Monroe, and Waterford. Or contact us by form or phone call. We can’t wait to meet you!